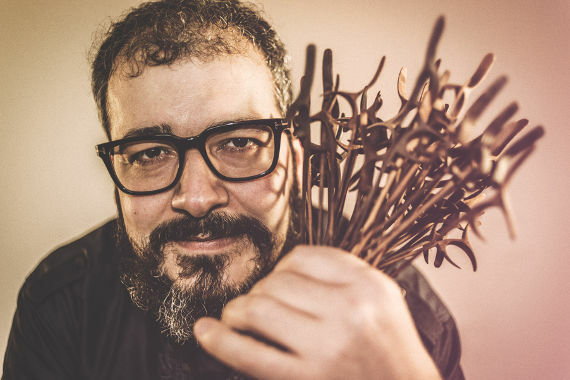 Since arriving in Canada in 1996, Iran-born Montreal-based musician, composer, and musical director Amir Amiri has established himself as one of the country’s foremost leading voices in Persian classical music. A santur player since his youth, Amiri’s relationship with the instrument––a 72-string hammer dulcimer––is almost spiritual in nature. In fact, as far as Amiri is concerned, santur is much more than a facilitator of sound or even a language to be learned, it’s been the elixir of his life and the teacher of some of the greatest lessons he’s ever learned. As a result, Amiri has worked extensively as both a performer and consultant for numerous Canadian dance and theatre companies, orchestras, concert series, and in film and television for more than 20 years. Through various musical collectives (Ensemble Kamaan, Moody Amiri, Perséides, and Sohbat) he has actively contributed to the blending of Eastern and Western musical traditions while his solo efforts continue to seek out new and ever-evolving ways to bring santur music into the 21st century. You came to Canada from your home in Tehran in 1996 correct? Yes, I arrived in Calgary in 1996 to take part in a residency at the Banff Centre. I was immediately taken by the Rocky Mountains––the environment was just amazing. I fell in love with the Centre at that time and I thought, ‘Wow, what a cool place. What a great idea to put all of these artists and the luminaries of society in a kind of enclosed mountainous area and just allow them to be there and see what they come up with. There were so many kinds of artists living there as well. Of course there were musicians and composers, but there were also artist colonies full of dancers, painters, people who work with their hands like sculptors, you name it. Being in contact with each other created this almost electrical environment. I don’t know how else to describe it, it wasn’t normal, it was electricity. “We were all so full of ideas and the Centre really helped to foster that and enable us to think. We were always being told to go and contemplate about what you were contributing. For the first time in my life I realized what it is to be an artist. I realized how much I love it and how much of it was a responsibility that I wanted to take on. Was that a culture shock for you? At that time, I had very little knowledge and grasp of the English language, so there were some language barriers. What ended up happening was that I was immediately approved for another residency at the Banff Centre, but I actually decided to go back home. I thought, ‘No, No, I need to go and sort out my life.’ So, I left and then returned a few years later once I had a better grasp of the language and I could stay in Canada because I had my status and all of that. When I returned, I immediately got in touch with the program coordinator at the Banff Centre because she had always understood my musical vision and supported my contributions. With her help, I’ve since been able to do over 20 additional residencies there. So the Banff Centre has become something of a cornerstone in your life as an artist? It greatly affected my life because I set out to search for a home here in Canada and in many ways the Banff Centre was it. Eventually, there was a sense that I needed to venture out and see what was going on with the rest of the country, so I went and lived in Calgary and Edmonton, Vancouver, Victoria, then Toronto, Winnipeg, and now in Montreal. I’ve lived in many different Canadian communities just trying to figure out what this great country is all about. I think so. I’ve had a chance to experience both the challenges and the beauties of this country, and no matter where I go, I am constantly reminded that the environment you are in affects or prohibits who you are. We are all mirrors of our environments; it’s really quite amazing. Talk to me about being an artist in Montreal. I moved to Montreal about four years ago and I love it here. It’s a wonderful place. There is such a diversity and intermingling of artists and people. There are all these different areas; it’s just fantastic. My only wish is for my friends and community in other parts of the world to be able to experience something like this. I mean, each place in Canada is unique, but Montreal is something else. Growing up, my specialty was Persian classical music. That’s first in my core and there are such magnificent musicians here. There are five or six Persian ensembles playing, working here, and making it happen; I’m not the only game in town, you know? That’s really important actually, in order to grow and to have healthy competition, so I’m really very happy here. You spent much of your youth in Iran studying the santur, which is integral to the heart of Persian classical music. In fact, you’ve had a lifelong relationship with the instrument. What is it about the santur that has had such a lasting effect on you? Well, we can talk about it from different perspectives: santur as an instrument, santur as a teacher, santur as a yoga instructor, santur as an identification card. I mean, for me, santur is an elixir of life. In technical terms, the santur is this trapezoid box, which is empty. It has some bridges inside it that hold the two faces together. Traditionally, there are 72 strings and they’re stretched around and on top of the box and are pegged on either side. It’s really so beautiful. Now, 72 is a concessional number. A concessional number is what? It means when you multiply a couple of numbers that are back to back like three and four. Because they are concessional, 12 becomes a concessional number too. So, eight times nine is 72, and this is a very important number in many cultures, in mathematics, and in geometry. With three triangles inside each other, it’s also a very strong numeric shape. And, when it’s tuned properly, this instrument is like a map of a celestial heaven. It’s unbelievable. It’s like you have 72 stars in front of you. The command of 72 stars is like driving a spaceship, really. Also, when you do these hits with your hands, like you have these upper body movements, it encourages a certain type of breathing. For me the breathing and doing this in different types of tunings it’s like a sort of cleansing system. Any time in my life that I’ve been in a lot of trouble mentally, physically, or whatever, when I play the santur I know I will be saved, you know? I will come out of it. What drew you to the santur as a child? This instrument has a real magic to it, so I think it was the sound that I fell in love with at such a young age. I was four or five years old and I was fascinated by its order. When you look at it, it’s like a very advanced machine. I also knew early on that I wanted to write music on it. I had a lot of feelings and things that I wanted to say in my own words but couldn’t, so through this instrument I was able to do that. Playing the santur almost puts me in a meditative state. It prompts me to form relationships with my surroundings because it allows me to go inside; I’ve always loved it deeply. I have met so many great musicians who have said that their instrument takes them somewhere else also, but for me personally, it is the santur. It’s in the shape, the formation, the fact that it is a pentatonic instrument versus a chromatic instrument––I think these limitations are always a wonderful thing when it comes to music. One of the most beautiful lessons we learn as humans through art is to work with limitations and how to overcome them. I can’t tell you how many of the lessons I’ve learned through santur playing have been applicable to my daily life. This is the purpose of art for humanity––it teaches us how to speak to each other. You mean music as a universal language? Absolutely. You can have two scales that have nothing to do with each other at first glance, like two communities let’s say, and somehow through one note they can relate to each other. You’ve been performing within the tradition of Persian classical music for close to 30 years now. Do you ever feel as though you are running out of things to say musically? When I look at the santur, I’ve always felt like, ‘Oh my God, you can do so many things with this instrument.’ But, in earlier years it was easier. In the early 2000s when the culture was starting to explore this whole concept of fusion ideas, East meets West, and things like that, I was very active in that scene and in bringing these two ideas together. During that time, spark flews, they actually even had a few babies, but then they left each other. [Laughs] They left town and everybody grew up and it was like, ‘Now what do we do?’ It’s a very interesting question. As you said, I’ve been doing this for close to 30 years now so I am constantly asking myself, ‘What should I do next?’ As far as expressing the essence of the music and what it means to me. It’s interesting because lately I’ve actually been going back to the traditions and spending lot of time and energy doing that. Not only with my own traditions, but traditions of Western classical music like Bach for example––music made by the many great that came before us. Why is that so important for you right now? It sort of acts as a reminder of our humanity and history, you know? Unfortunately, history is written by the victorious ones. And, I’m not talking about a tangible history of this king or that king; I’m talking about human history. Like human bodies and the history of existence––of emotional existence and of you and I. If that is attached somewhere in history it’s good to study it, especially in music, because you realize a lot about what we went through emotionally. In my experience, all art, all creations, are about access. When I write music, I go and I mine the music out; it’s very much like the music already exists somewhere out there, you know? Some people go and meditate and get an access. Some people sleep in the afternoon, and at that golden hour after twenty-minutes, they wake up and that’s their access point. Some people will go for a walk in the mountains. Some people used to make candles or other romantic types of things. Some people just go for a run and come home and write three lines that are magical. So, having history and having access to our body of memory, for me it’s basically an access point. It cleanses you out of your patterns. It clears your body and you go, ‘Okay, back to zero.’ That’s the situation for me right now.